Since 1937, Ray-Ban has continued to evolve, fitting its iconic styles with extraordinary innovative lenses that boast cutting-edge technology and a variety of colour palettes. Choose the lens you need to create the look you want from Classic, Gradient, Polarized or perhaps something a bit different from the 'special' range. The brown lens features the same high performance qualities as the green G-15 lenses but they are not identical. The brown lens provides greater contrast in low light conditions, giving you the power to see more clearly when other mere mortals may lose their way. Following the classic G-15 Ray-Ban lens, the gradient lens is also an iconic and instantly recognisable look. The crystal lens is tinted on the backside using high vacuum processes. This allows the adhesion of thin layers of oxides to the lenses to achieve smooth colour transitions. The plastic Ray-Ban lens achieves a transition in shading from dark to light thanks to a precise chemical immersion process. 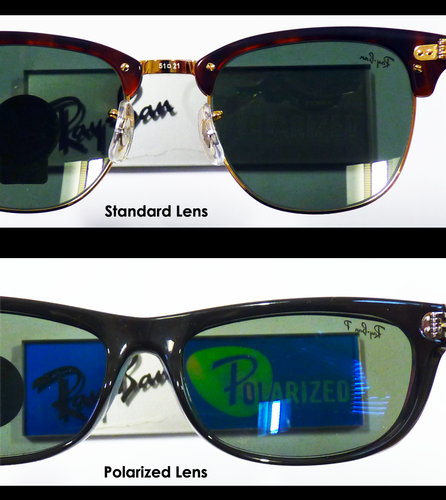 The 'Ray-Ban P' Polarized range substitutes the standard sunglasses lens for the enhanced Polarized lens. Eliminate distracting polarized, aka reflected, light from reaching your eyes. That means a drastic reduction in the brightness of shiny surfaces, like chrome, and large bodies of water. This special lens eliminates glare, enhances contrast, reduces eye strain and increases visual clarity - as you can see in the image comparing the standard and polarized lenses. The polarized lens is identified with a unique 'Ray-Ban P' signature to the glasses lens. Already the lens of choice for many famous Ray-Ban wearing icons, once you have tried the Ray-Ban Polarized lens, we think you will never want to go back to a standard lens again. A classic 70s and 80s look, the Ray-Ban Mirror lens is cool, timeless and iconic. The mirror coating application on this lens is achieved through an advanced technological process where superheated metal oxides are fused to the lens at molecular level to ensure a uniform layer. The mirror coating will help to reduce glare, deflect envious glances and give you that unique look. The new, limited edition Ray-Ban 'Legend' lens is realized in high quality crystal ensuring protection from UV rays. They also deliver better clarity of vision and remarkable colour contrast. With various colour and style combinations to choose from, they're vintage but not stuck in the past.